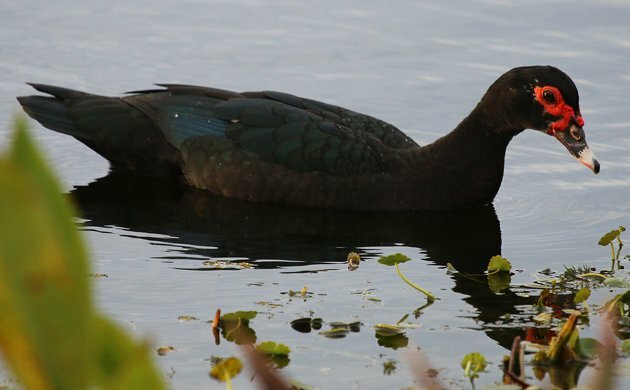 I was at the Blue Heron Wetlands in Titusville, Florida, during the Space Coast Birding and Wildlife Festival hoping to connect with a Purple Gallinule that the field trip I co-led with Laura Erickson failed to find. I wasn’t having any luck at all though I was enjoying the typical assortment of wetland species that make we New York birders a bit jealous of our southern compatriots. Then I saw a pair of birds, the pair pictured above, and I suddenly had a dilemma on my hands. I knew that I could count the introduced Muscovy Ducks in front of me but did I want to? You see, Muscovy Ducks are countable in the American Birding Association area due to wild birds from Mexico making their way up into Texas. This is natural and it is perfectly fine to count those birds as they are wild and naturally occurring. * The birds in Florida, on the other hand, are of domestic stock gone feral. They would never be roaming around Florida frightening people with their fleshy faces if not for their repeated release and escape from captivity. 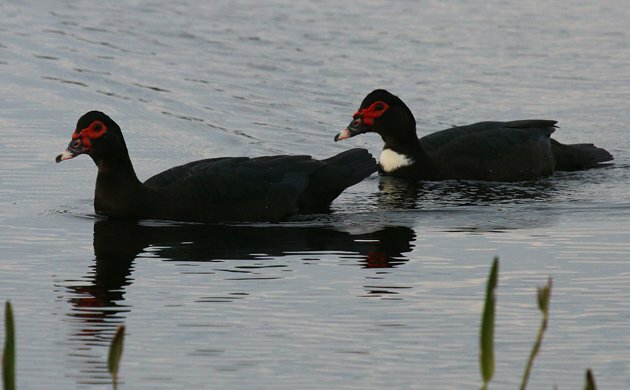 Despite their questionable background, the feral Muscovy Ducks of Florida are on the state checklist, which only makes sense as they have spread across the state wherever people have settled and provided habitat. Which, considering the amount of ponds, marshes, and other wet areas in Florida, is almost everywhere that people are. So the bird is on the state checklist which makes it countable in Florida. It is also on the ABA list, which makes it countable in the ABA area. Why would I even think twice about counting it? First of all, I am lucky in that I saw actual wild Muscovy Ducks in Honduras in 2009, so this is not a decision that matters in terms of my life list. I don’t keep a Florida list so I don’t particularly care how many species I count there. 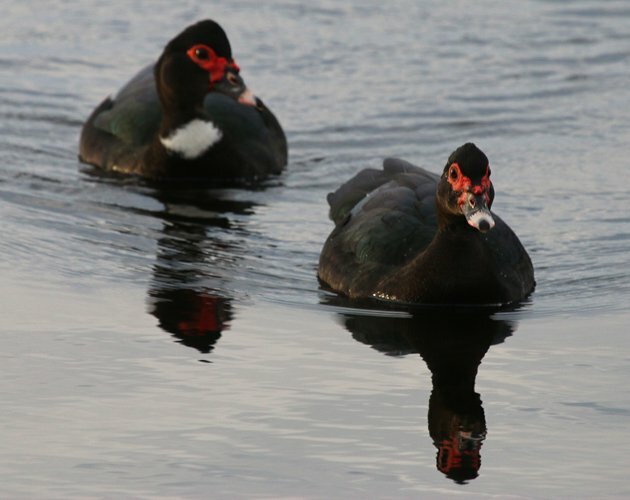 But, having never birded Texas, I do not have a Muscovy Duck on my ABA list. Could I count these two birds for species number 515? I answered this question the way I imagine most birders would. I asked myself, “What would Neil Hayward do?” You know, Neil Hayward, the reigning ABA area Big Year champion and all-time record holder? Yeah, if he would count Muscovy Duck in Florida it must be alright, right? And, sure enough, he did. So, yay! I have another bird on my ABA list. Of the three species I added during my six days in Florida two of them were introduced. Somehow, though, the Nanday Parakeets “felt” more wild and I had no compunction about adding them. Muscovy Ducks in Florida just feel like aquatic pigeons and are not a bird that I would have gone out of my way to see. They certainly are no Mottled Duck! Oh, and if you want to see a nice assortment of Manky Muscovy Ducks, well, you’ve come to the right place! *Though in 2008 the ABA changed Muscovy Ducks to “Code 2” which was a reflection of the fact that the feral birds in Florida are countable. **Thanks to Donna Schulman for finding this link for me. I so need a WWNHD sticker to slap on my scope. We should totally make them. I bet we would make at least $5.00. Ebird let me list the feral Muscovy I saw in New Zealand but not Australia. I much preferred seeing it in Belize though. Just for the record, Mexico–and certainly not northern Mexico–is not part of Central America, as suggested in this post. It is, however, part of Middle America and North America. Thanks, Michael. Your point is noted and the post has been amended. Where Are You Birding This Third Weekend of February 2011?